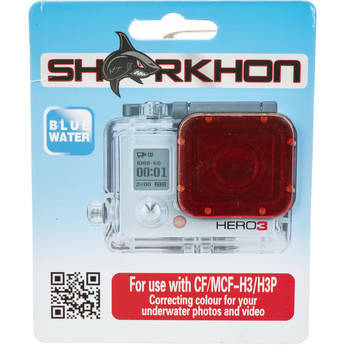 The CF-H3A Replacement Red Filter from Sharkhon is a replacement for the PMMA lens of the CF-H3P/-H3 Red and MCF-H3P/-H3 Magenta Filters. This color correction filter is designed to remove cyan color casts when the camera is used in blue-based waters, such as blue salt water or clear fresh water. It is suitable for use at depths ranging from 10 to 66’. It attaches to the rubber hood of the CF-H3P/-H3 Red and MCF-H3P/-H3 Magenta Filters for easy replacement of the existing filter.